Friday, July 25, 2014…..”as an elephant’s eye”? 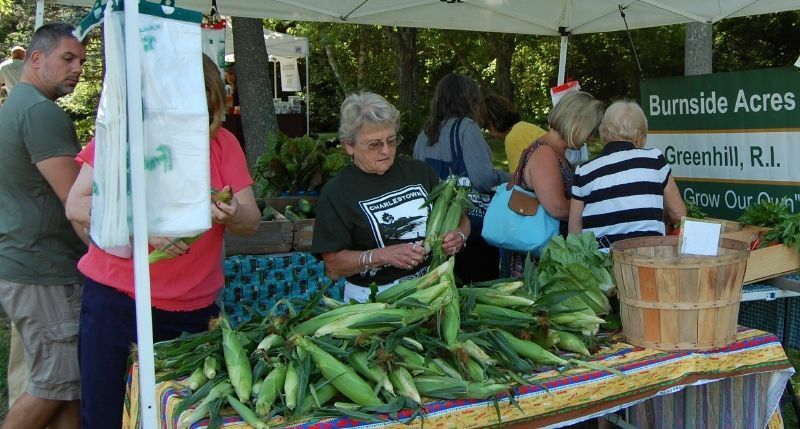 Well, it looked that way from the produce at our market this week! There was corn in abundance! And more! 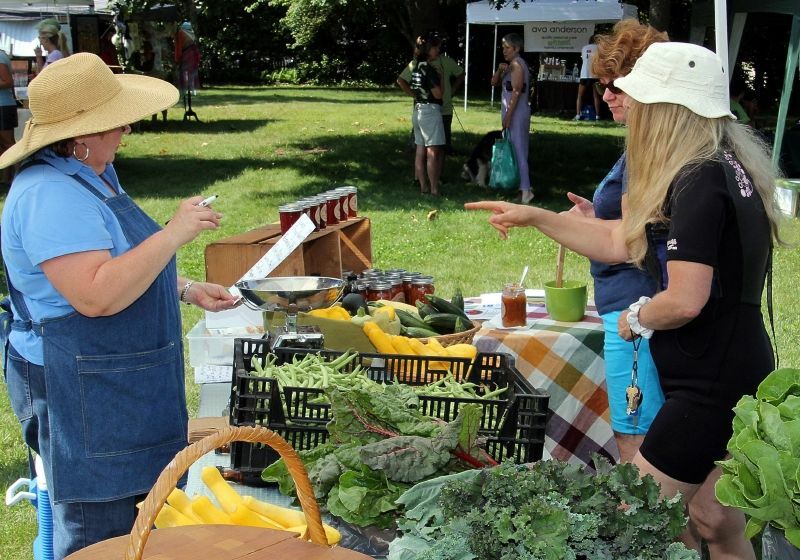 Peaches are starting to ripen, the blueberry harvest is cresting, and there’s a full array of seasonal, scrumptious summer garden vegetables and flowers. 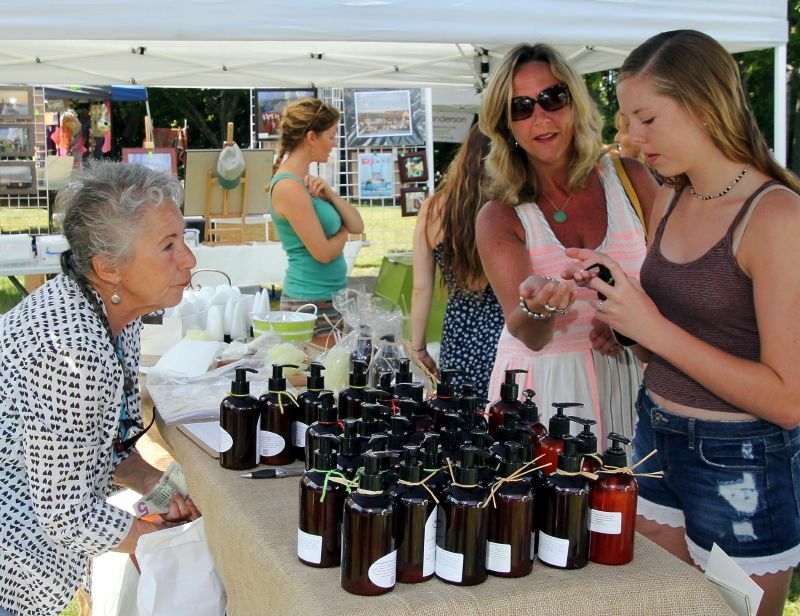 In addition, our market features items that may not come from the farm directly to our table, but they help us celebrate our open spaces with products formulated, designed, and crafted in South County. 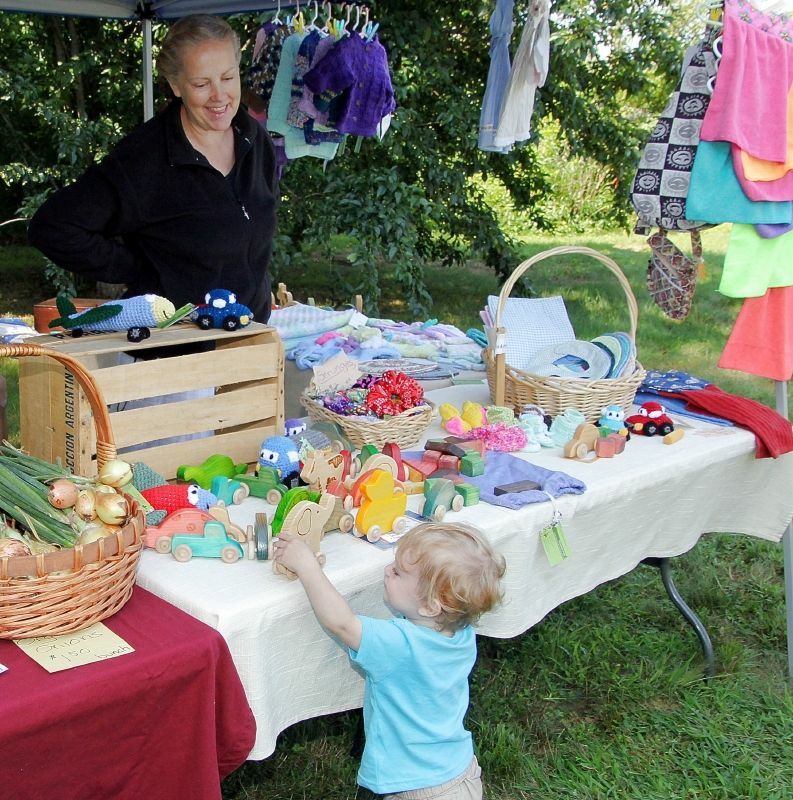 There are soaps and creams, spun fabrics, homemade toys with safe, smooth finishes, fresh lemonade, and photographs to keep as a reminder of South County days. Let’s not forget about the birds. 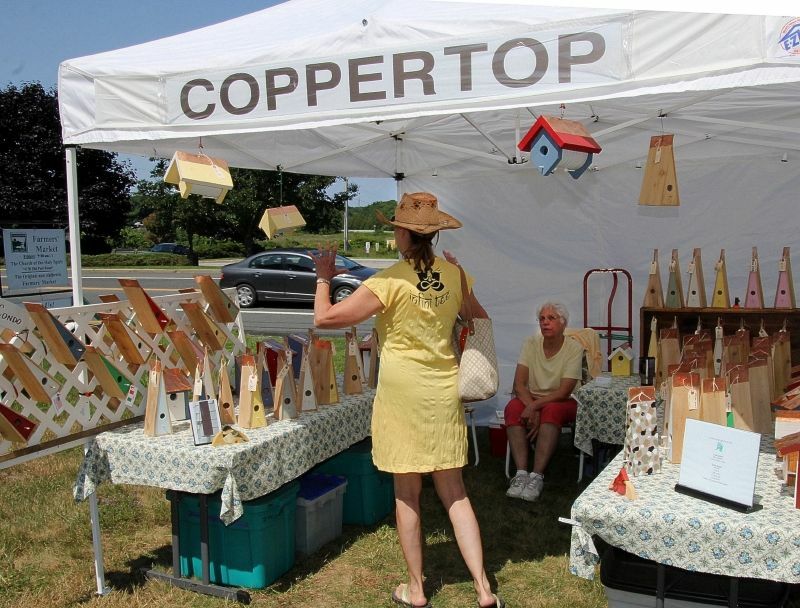 Birds fly in open space, and then they seek a resting place of their own…..Check out our Coppertop bird houses! 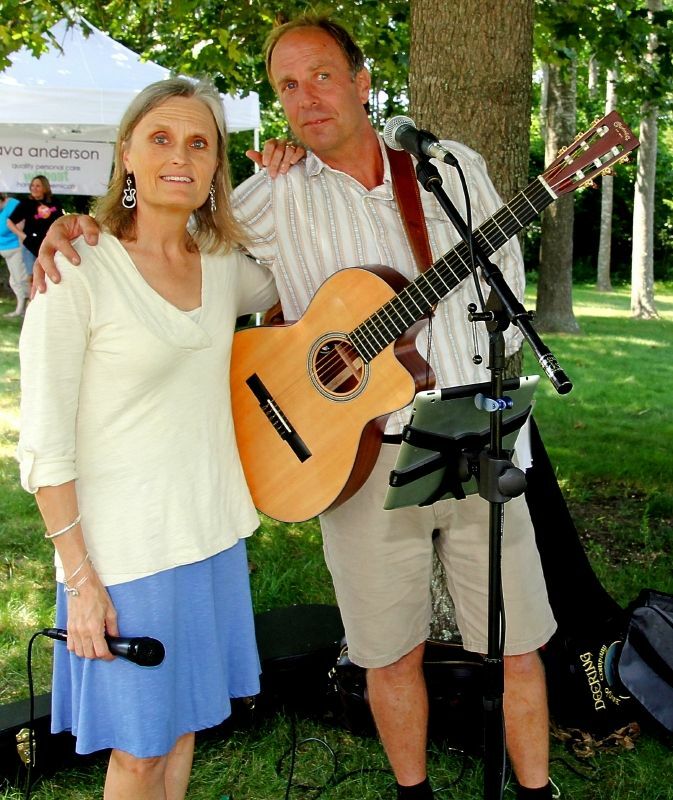 Always there is music at the market…This week by Mike Bussey and Lisa Hazelwood…Lucky Us! This coming Friday, Aug. 1st? There will be a program on Corn Husk Dolls. Come try your hand! If you’re someone who likes to plan ahead, on August 15th and 22nd from Noon to 1 PM Jay Primiano will be available to sign his book Swim that Rock. 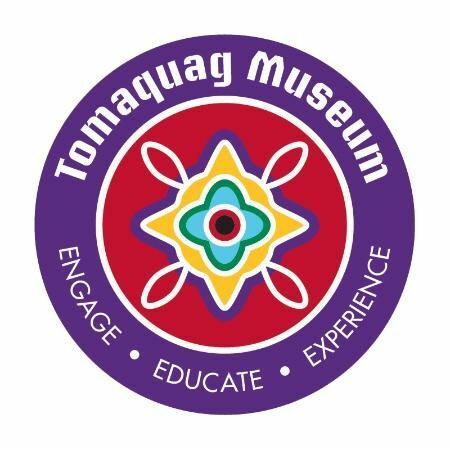 Copies of the book may be purchased fro $17 at the Land Trust Market tent starting this week…Then you can bring the book back in mid August for a signature by the author! 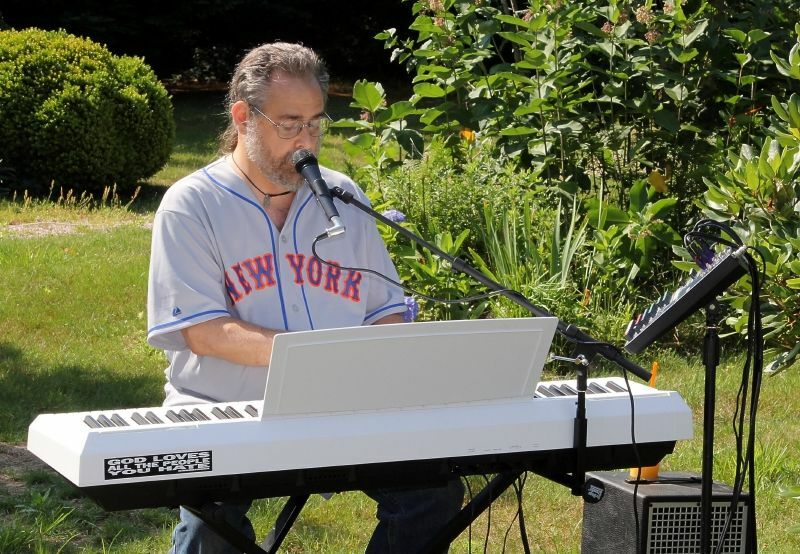 Friday, July 18, 2014 ….and some bluesy music mixed in with a host of other tunes by Jon Campbell, our noted musician for this week….What a day for the market! First – the BLUEBERRIES! Jerry’s Berries made a debut the week before, but this week those berries were abundantly present! 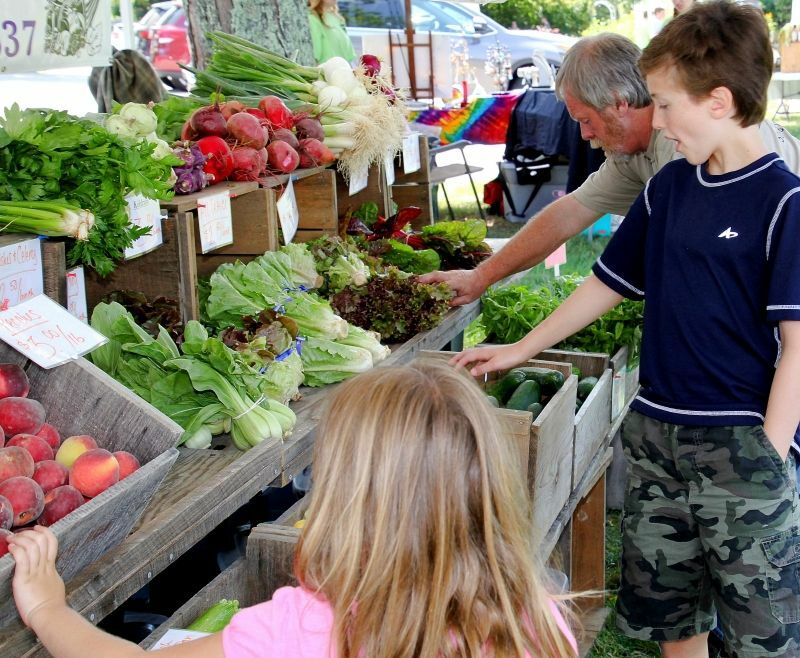 Juicy, ripe, and delicious…We’ll be featuring these South County delights until their season ebbs…. 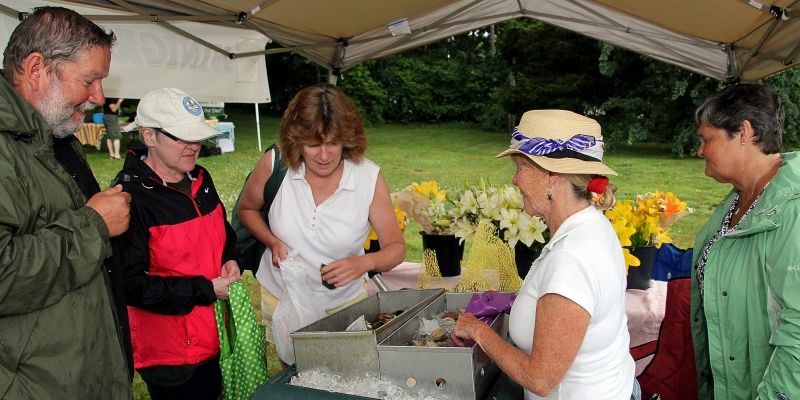 The vegetables at the Charlestown Land Trust Farmers’ Market are top of the line – but for some of our shoppers there are meat and shellfish items that are sought each week. 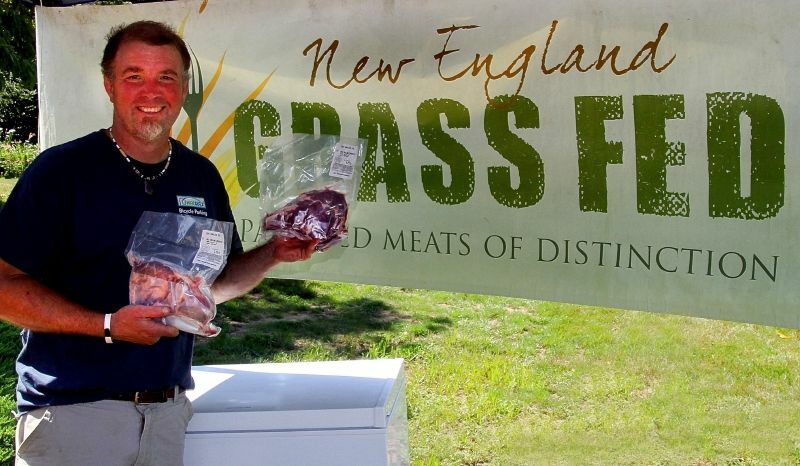 New England Grassfed offers a weekly assortment of locally grazed beef, pork, and rabbit – all grown humanely under our Rhode Island skies. 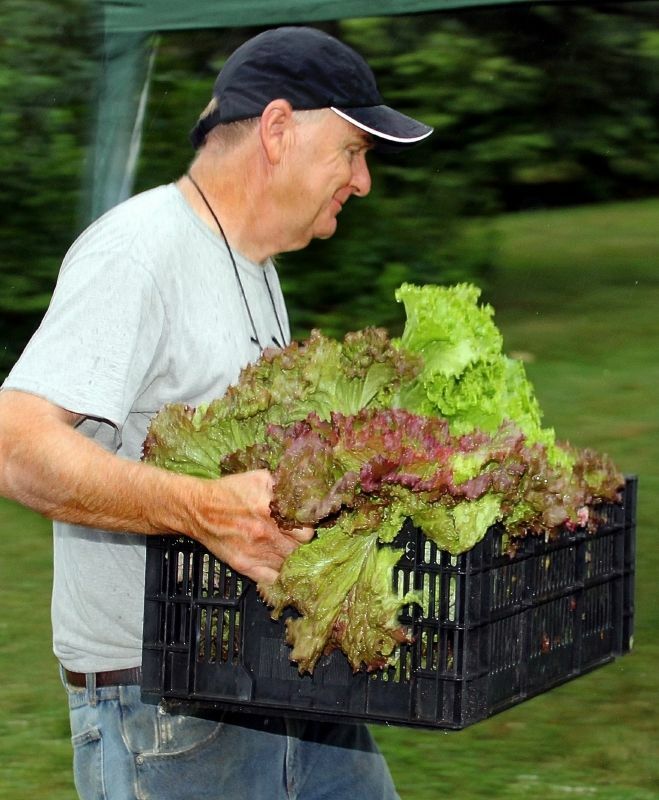 Meet Pat each Friday morning, the local purveyor of New England Grassfed. His enthusiasm and knowledge of his products will be an invitation to try some of his delicious cuts of meat. If seafood is your penchant, then there is none fresher, sweeter, or more delectable than what has been harvested from Ninigret Pond. 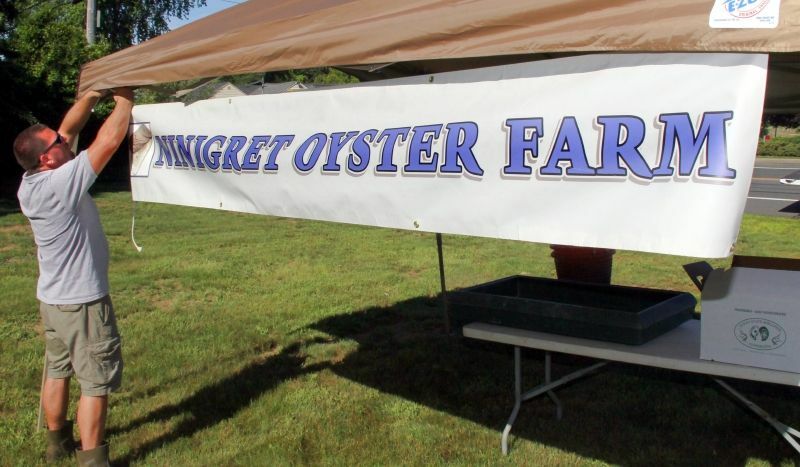 Ninigret Cup Oysters, nationally acclaimed for flavor, top the list at Rob Krause’s Oyster Farm vendor’s station. Most weeks there are also little necks and sweeter-than-sweet steamers…Every now and then a bag of mussels will appear, or, on special occasions, some smoked bluefish or striper (caught by Rob and smoked by his brother-in-law, Andrew Nathan of Sea Goose fame). It is always a pleasure to let a customer know that before the market opened that day, the shellfish was residing in the “pond just down the street”. 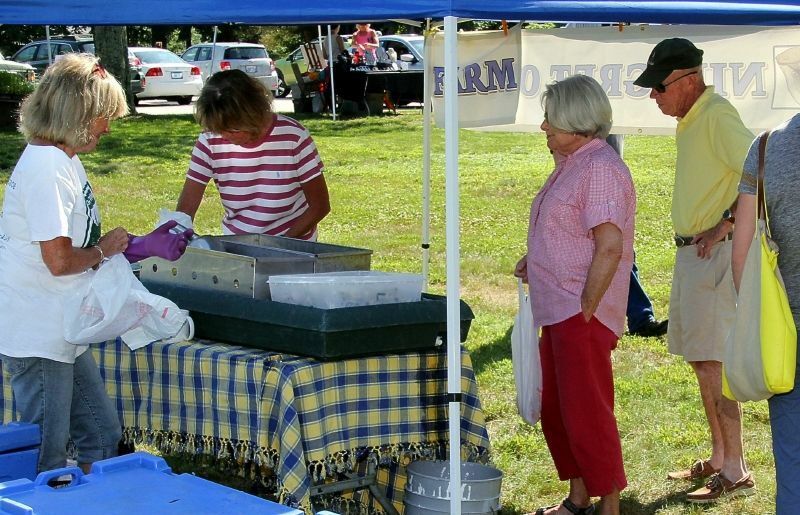 A morning with a fine array of local vendors, a welcome second visit from the RI Beekeepers Association. 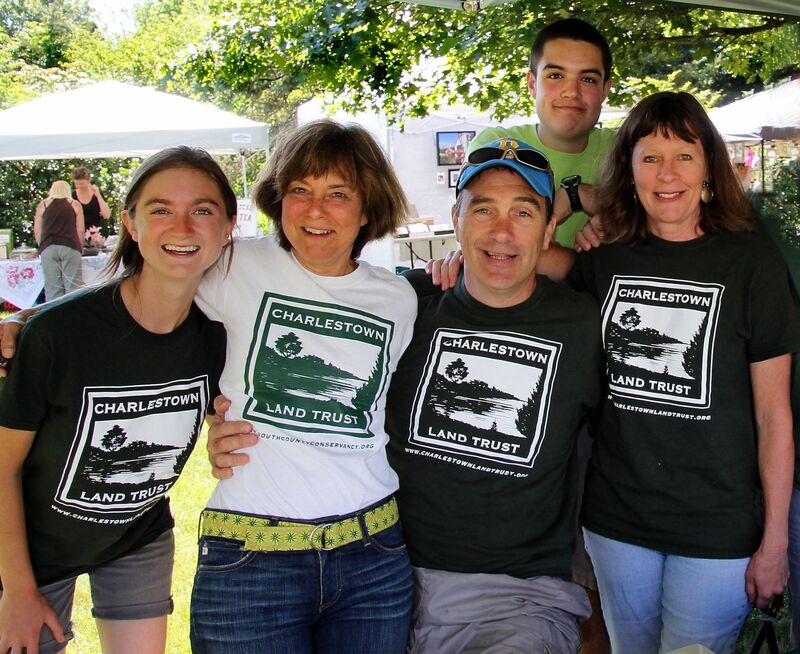 refreshments abounding, and lots of info for visitors and good cheer emanating towards the country feel of the Charlestown Land Trust Farmers’ Market – what could be more of a pleasure? 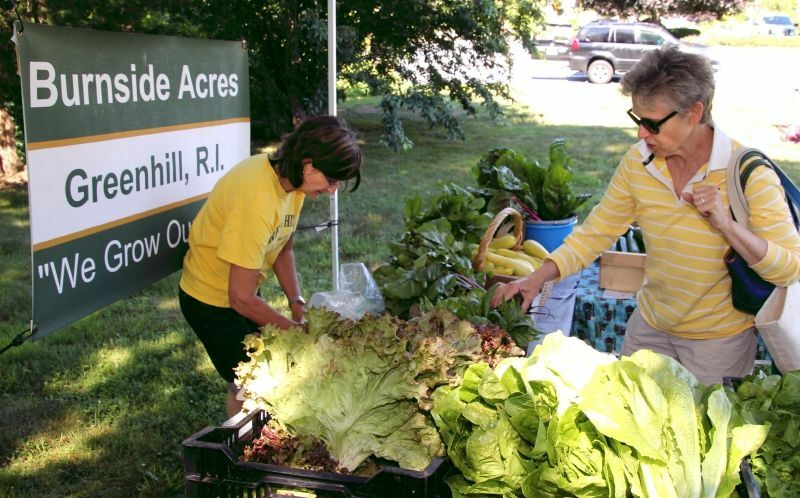 July 11, 2014 For a growing number of people shopping at the Charlestown Farmers’ Market on Friday mornings in summer is a bit of the rhythm of life. 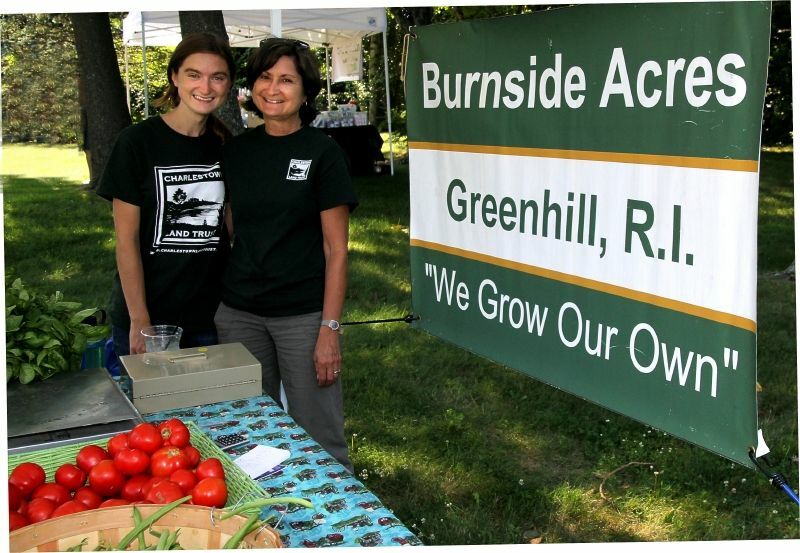 People count on the fresh vegetables, flowers and fruits from Burnside Acres… and Paradise Hill………. 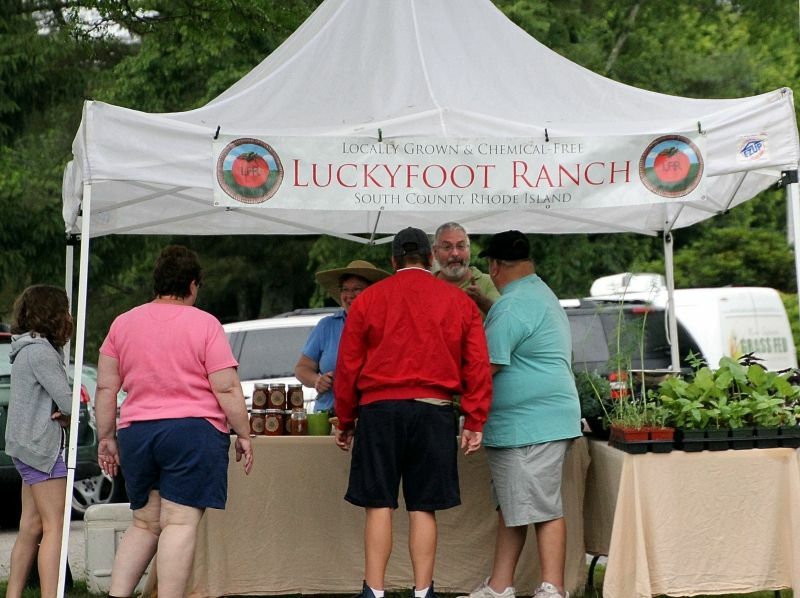 This year we have been joined by Lucky Foot Farm as well. Lucky us! 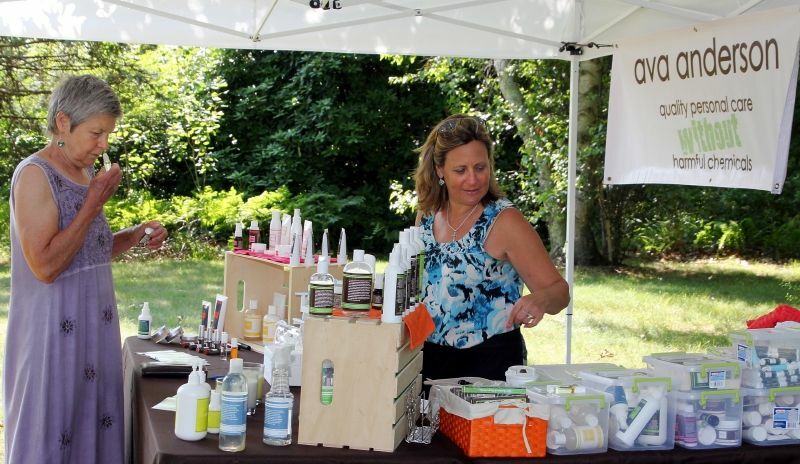 For those interested in other items that are both healthful and helpful, our 2014 market is pleased to feature personal care and cosmetic items from Ava Anderson. All products are produced according to stringent guidelines yielding high quality, non toxic results and consistent customer satisfaction. 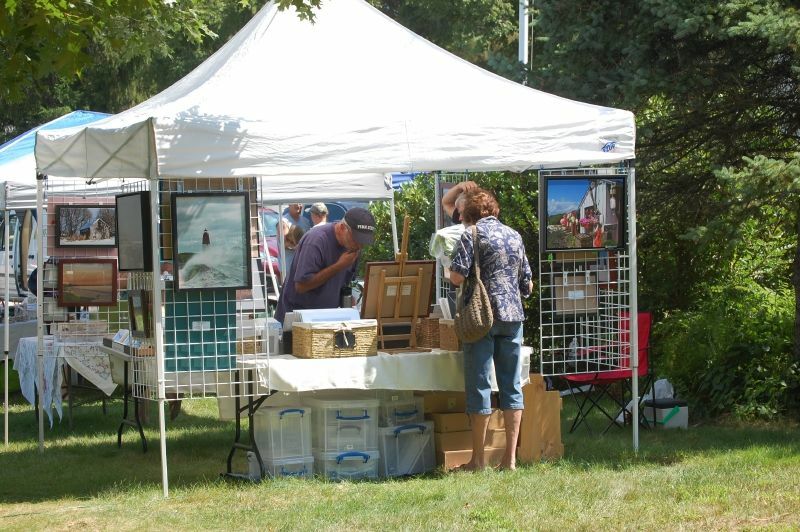 As they made their way among the vendors, shoppers at the July 11th market enjoyed the music of Chris Fee. 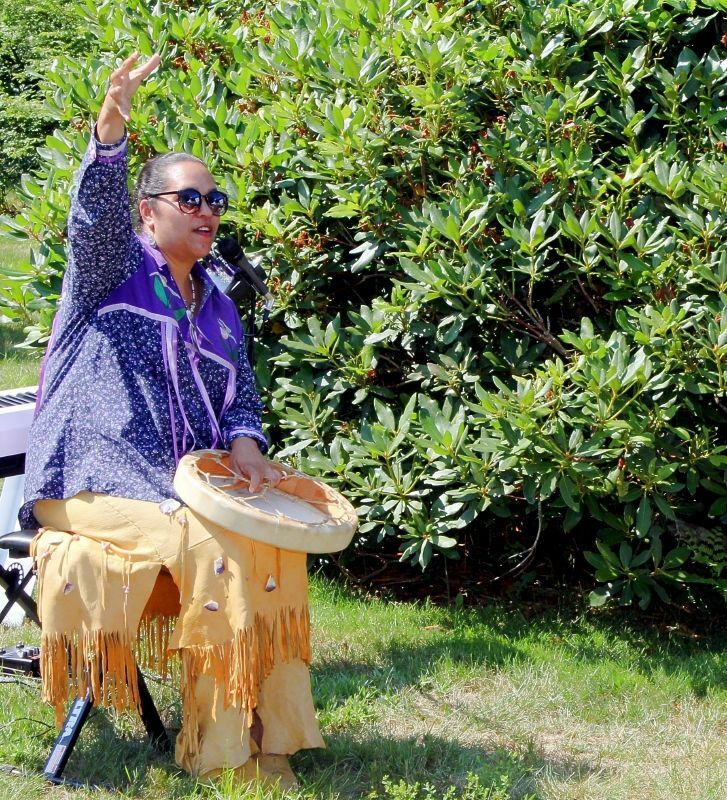 Last Friday’s special event captivated an audience with the storytelling and music of Loren Spears, local Narragansett Tribal Councilwoman and Director of the Tomaquag Museum. 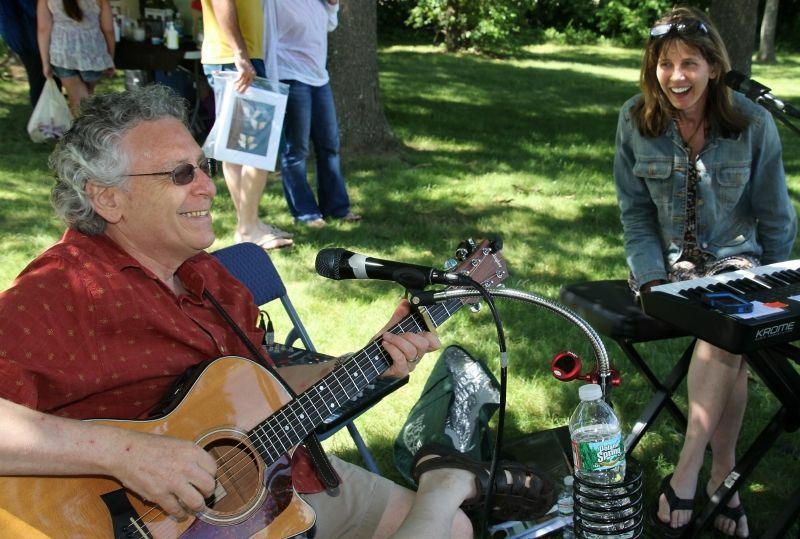 This coming Friday, July 18th, the Market will feature the music of the renowned local musician, Jon Campbell. 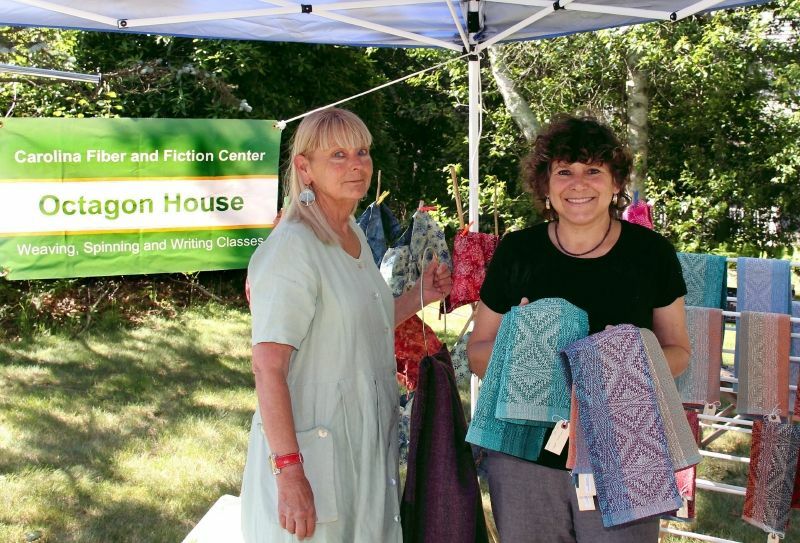 The RI Beekeepers will be back with honey and beekeeping lore along with the Colors for a Cause Gold Firetruck so bring the kids and your shopping bags! One more thing…It’s Blueberry Season! 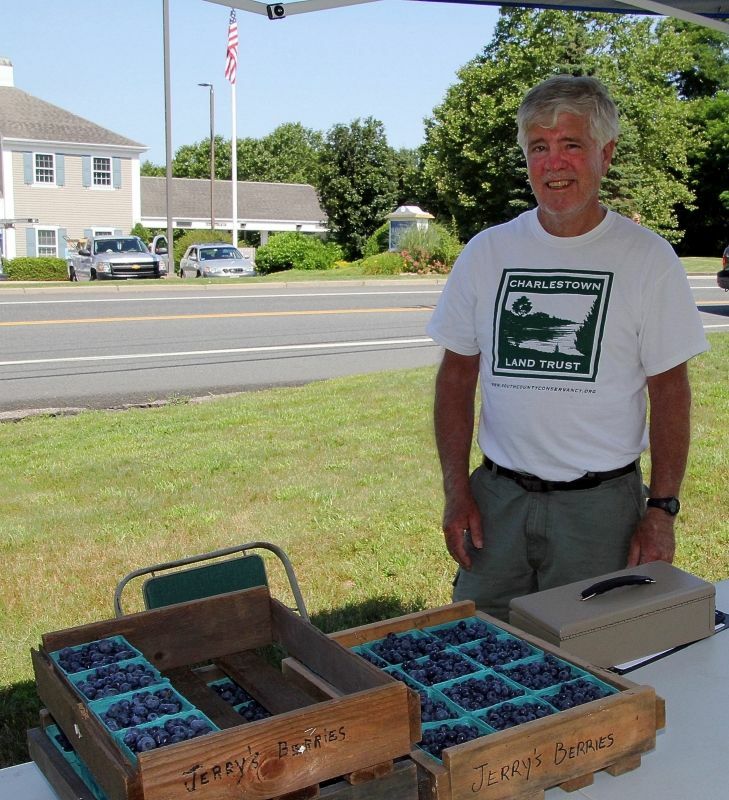 Jerry’s Berries, those local blueberries that sell our every week, will be available….so come early! 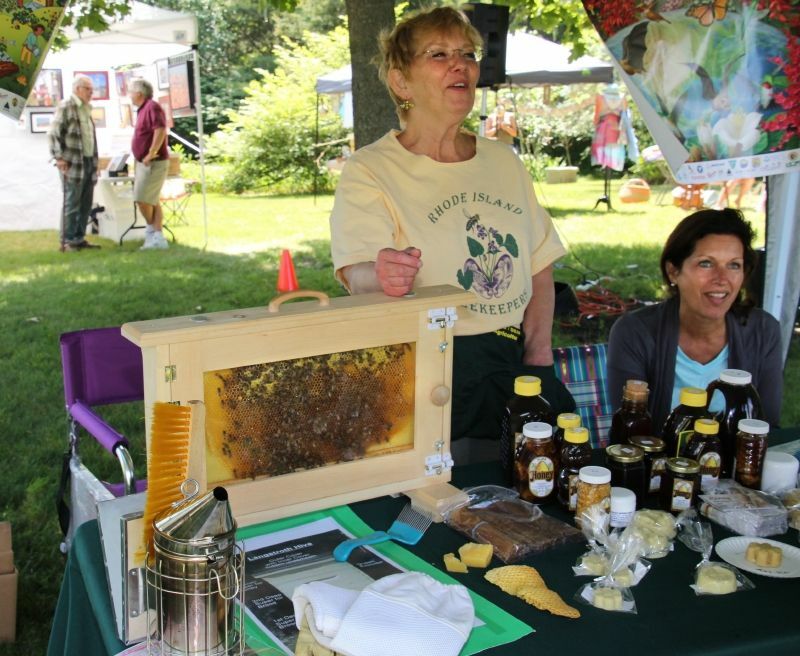 Fri., June 27, 2014…..The morning WAS a’buzz with a visit from the RI Beekeepers Association. Friday morning shoppers could catch bees at their industrious routines (safely enclosed). Information on beekeeping along with the availability of honey gave Friday morning shoppers good reason to stop at the Beekeepers’ table. 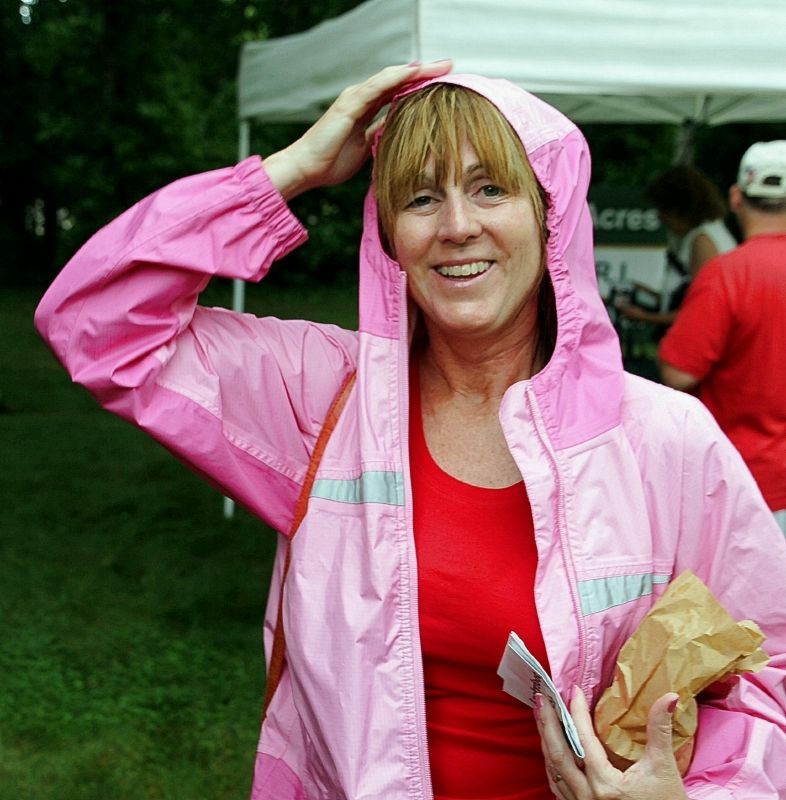 ….and volunteers offered welcoming smiles along with support to visitors and vendors. 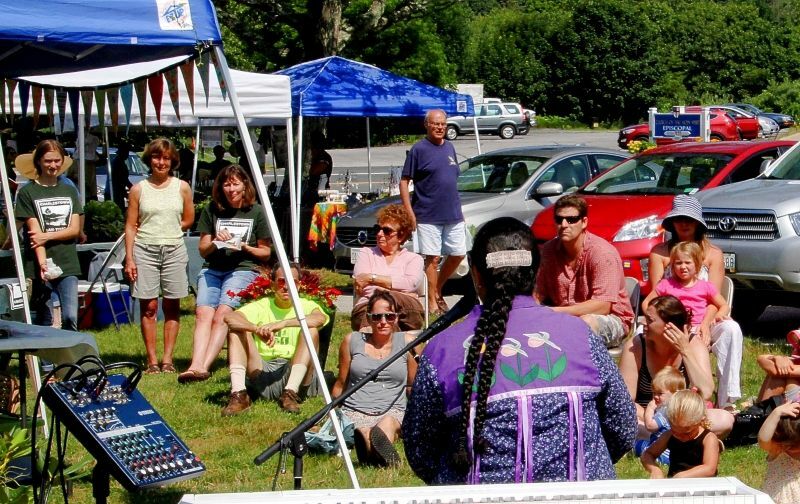 Hear the sounds of John Farm Dog at our next market on The Fourth of July! 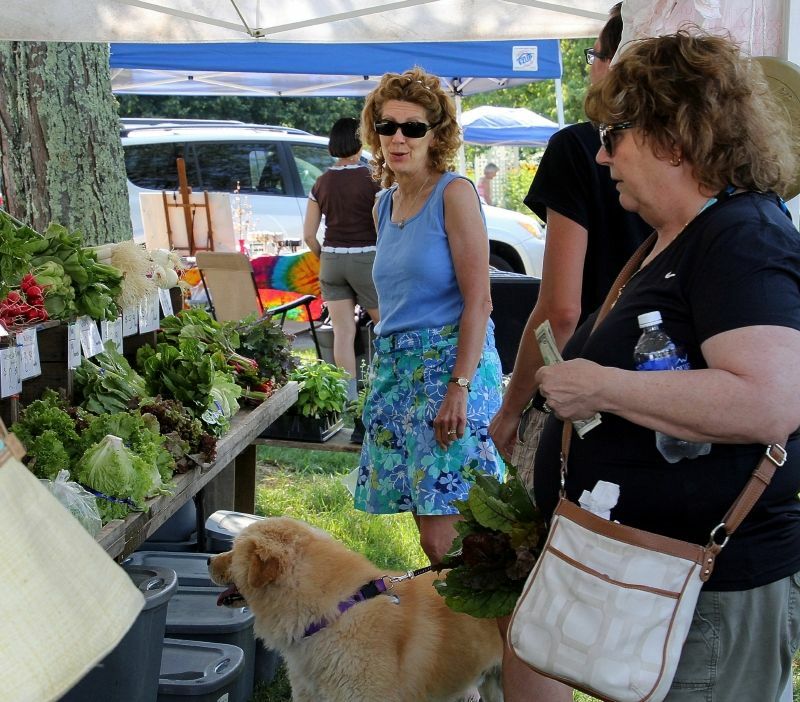 Vendors will be waiting to help make your holiday celebration a deliciously festive one!